Get ready for Valentine's Day at Red Stag Casino with the $3250 Western Romance Freeroll! Spin the reels of the Dr Love slot from February 1st to February 14th to test your luck and try to win your share of all the free money that's up for grabs for the top 75 players. GOOD LUCK! $3250 “A Western Romance” FREEROLL February 1-14! It’s time to compete for some serious cash prizes! 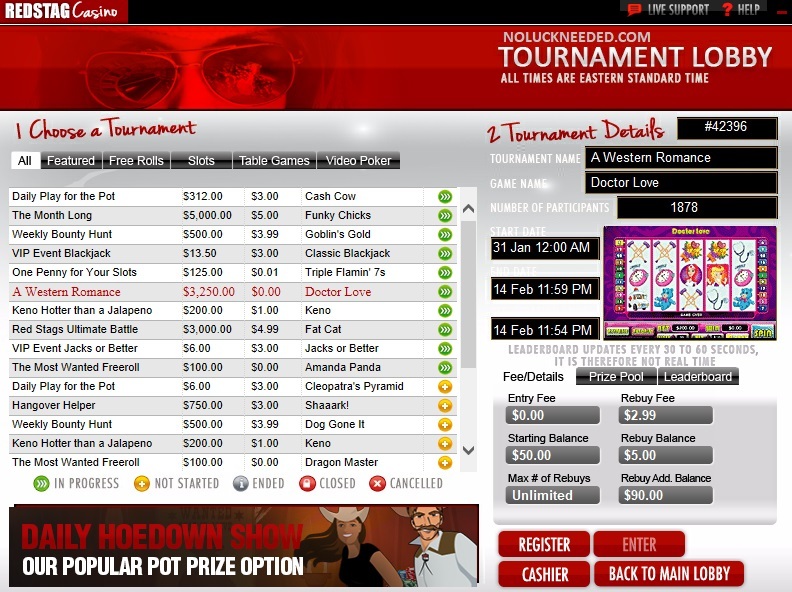 From February 1st to 14th we’re running “A Western Romance” Tournament running with our hit slot, Dr. Love. A total $3,250 prize pool goes to the top 75 players, with completely FREE entry and Re-buys for only $2.99. Get in on the action, login and play! Game: (varies weekly); Entry Fee: $0.00; Stake: $20.00 Re-buy: $2.99 for	$30.00; Top 50 places paid! $300 First Place! Play the $3250 Western Romance Freeroll at Red Stag Casino! I lost but may rebuy.